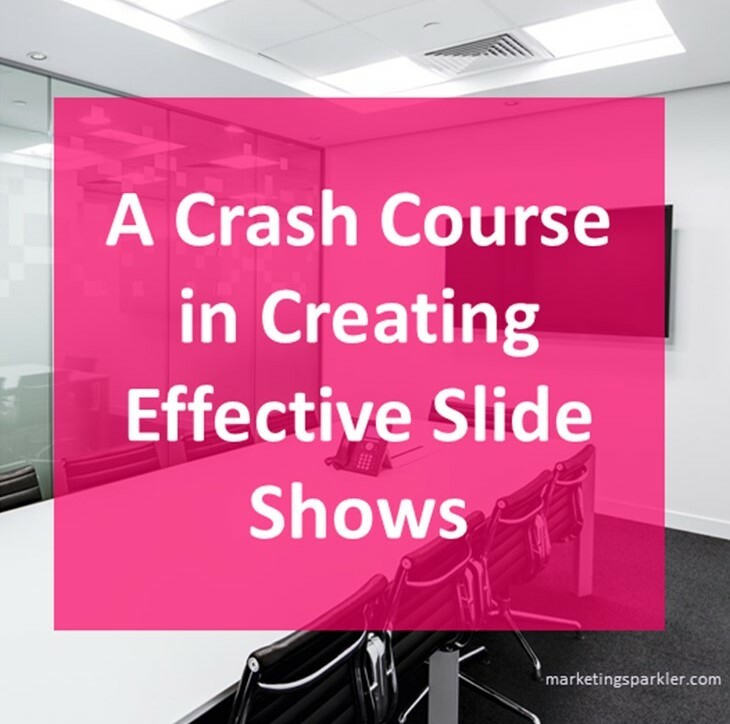 In an earlier post, we introduced slide shows and how you can use them in your content marketing. Slide shows have a conservative, boring stigma attached to them, but they shouldn’t! Long thought of as the tool of choice for stodgy corporate America, slide shows have gotten a bad rap. You have probably been exposed to some dynamic slide shows, so dynamic that you didn’t even realize they were slide shows. Slide shows aren’t just for corporate stiffs. They can be a powerful marketing tool! Slide shows can be an effective marketing tool, if you can design a show with impact. Before we discuss the makings of a great slide show, let’s talk about application. 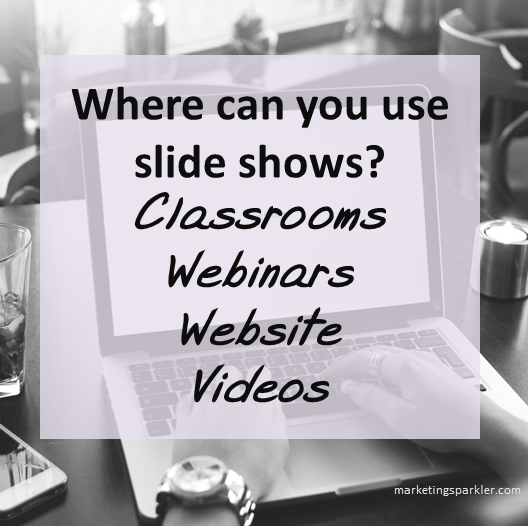 Where you can use slide shows? Using slide shows to teach in the classroom helps your students get a visual of what you’re saying. Showing your audience different types of images through PowerPoint slide shows enriches what the speaker is saying. Photos, graphs, charts, maps, illustrations and highlighted text give the student another perspective on the subject matter of the presentation. Add charts and graphs to your slide shows to explain stats. Better than text! Other applications: If you’re not in a classroom, do you host seminars and workshops? That’s still teaching, same thing! Portfolios showcasing images from a single product can be displayed in a compact and organized manner with a slide show. Web pages can benefit from having a slide show that features the benefits of your services or your products services. Or use a slide show to showcase your best blog posts. Slide shows are natural element of a webinar. They turn a boring voice presentation into a visual follow-along for your attendees. Think about the webinars you’ve attended. Didn’t they use slides? Think about it: webinars are slide shows with audio. Any business can use slide shows! A slide show naturally works well as a video. By adding in narration, you can quickly create a training video, how-to video or even a product demonstration. Use your own quality photos, charts and illustrations instead of the ones provided by PowerPoint. Opt for images that work well on both a laptop and a small mobile display screen. You should have more images in your slides than text. Don’t use random images to embellish. Use images to reinforce your message. Images should help explain or tell the story. If you don’t have your own images, you can use stock images from sites like Fotolia, Big Stock, etc., just keep copyrights in mind.Whatever you do, please DO NOT use images you find on Google. That’s stealing. Don’t steal. Begin by creating an outline of what information you want to include. Gather your images and copy. Keep your design simple and basic. Pick a font that is easy to read. Select a font and color for headers. Use the same font on all the slides. Keep colors the same or coordinated throughout. The best choice is always going to be a high contrast, something like black text on a white background. If you use a colored background or text, keep the contrast sharp. Don’t use too many colors at once. Match colors to the design and your branding. Use text sparingly. Nobody wants to read a paragraph on screen. No long sentences. Stick to power phrases. Use bullet points, but sparingly. No more than 5 per slide. Use graphs, charts and simple graphics to get your point across. Instead of a long list of bullets, use a short blurb. The main thing to remember when creating your PowerPoint slides is to keep it simple and straightforward. Don’t use a lot of transitions, images and design details that overwhelm what you are presenting. When creating slides, remember: keep it simple and straightforward. Using a pre-written script for your slide show presentation is a good option when your presentation will be recorded. But how about scripts for a live setting? How can you create them and still have a personal touch? You still need a script, but it will be more like an outline. A script will help you deliver a quality presentation or webinar without the verbal pauses (uh…., ummm…, etc.) that comes from trying to do a live presentation off the top of your head. Learn how to create a script for your slide show in a live setting. A good, well-developed script should accomplish three parts to your presentation; the introduction, the main body and the conclusion. It’s best to know your material when creating a successful presentation. Knowing your material means your script can be more of an outline than a detailed script. Use the bullet points from your slides as cues to what you want to say. You should be able to talk for two or three minutes about each bullet point if you know your subject. Use a typed out cue card script if you have mostly graphics in your slide show. Another option is to fully write out every word of your script and then to memorize it. Just make sure that your delivery doesn’t come off as uninteresting and boring. Slides should be used as cue cards to talk about your subject matter. Once you’ve created your full script or cue cards, rehearse it. Go over it several times until you are comfortable with it. Then you are ready to go ahead and give a good presentation. Use an external microphone if possible. There are many reasonably priced headsets on the market today. Find one that is comfortable and has good sound. Be flexible. Don’t be tied to your presentation script. Modify your presentation to meet the needs of your participants. Don’t read your slides. Paraphrase instead. Don’t try to say everything shown on each screen. Use short bullet points so you can fill in with your own words when speaking. Engage your audience from the beginning. Tell a story, use humor or ask a challenging question. Give your attendees examples and personal anecdotes. Review and summarize your content in the end. Practice. Practice. Practice. This helps you get rid of the ums and uhs. Vary your pace and pitch. Add areas of calm and moments of silence. Show excitement in other areas of your presentation. Narrating your presentation doesn’t have to be boring or scary. Take your time before hand to practice. Make it personal and friendly and be confident in your speaking skills. Think about all the boring presentations you’ve had to endure. The ones where people had blah slides, and the presenter had the personality of a snail. Then do the opposite! Add some interactivity, ask questions, throw in some personal storytelling, and above all, have fun with it!